Coming up we’ll hear a tremendous and fascinating interview with David Smith of The Morgan Report, and regular contributor to MoneyMetals.com. David recently joined Money Metals president Stefan Gleason to talk about investment psychology, how you can discipline yourself to be a successful investor and what he sees ahead for the precious metals. Don’t miss an exclusive interview with David Smith coming up in just a moment after this week’s market update. Time ran out on Greece this week. And financial markets got hit with some of the most volatile trading action of the year. The Greek government was unable or unwilling to reach a financial aid deal in time to avert a default. Wall St Journal Reporter: Greece missed the 1.5 billion Euro payment to the International Monetary Fund last night, becoming the first advanced nation ever to default on the fund. The default won't have immediate consequences directly, but Greeks woke up gain on Wednesday to a third day of capital controls, a third day in which they were limited to withdrawing 60 Euros from cash machines. Greeks who had depended on promises made to them by the political and banking system are learning the hard way that they should have had a Plan B. The upshot for citizens of other countries that are financially overextended is that they still have an opportunity to make a backup plan before a financial crisis hits. And the reality is that over indebtedness is a global contagion. It afflicts most countries in the world today, including the United States. Consumer debt and government debt have reached epic proportions -- both in nominal terms and relative to GDP. The only way this ends well is if the economy miraculously bails everyone out. The world economy would have to post growth figures well in excess of what’s currently being seen and what even the most optimistic experts project. Otherwise, debt crises and currency crises are going to spread. This week Puerto Rico narrowly averted a debt default by negotiating a refinancing deal with bond holders. It buys time, but it doesn’t necessarily fix the commonwealth’s financial troubles. Puerto Rico’s government owes creditors $72 billion and presides over an economy with a GDP of $103 billion. By comparison, total U.S. national debt comes in at $18.2 trillion against a GDP of only $17.4 trillion. That’s right, our official debts as taxpayers exceed our entire economic output for a year. The U.S. has a far worse debt to GDP ratio than Puerto Rico and many of the world’s problem countries. It’s only a matter of time before the symptoms of a financial crisis in the U.S. become a full-fledged financial crisis. And most investors aren’t even being urged to hedge their bets. Treasury bonds are still considered by conventional financial planners as a low-risk investment!! But when that false perception of safety changes to one of danger, a lot of people will be running scared into hard assets. Some savvy Greeks began buying gold ahead of the bank runs and closures. The U.K.’s Royal Mint reported that in June Greek customers bought Sovereign gold coins at double the normal rate. As for the gold market itself, spot prices were curiously subdued even as global equities and some commodities swung wildly. Gold finished Wednesday at $1,170 an ounce and currently trades at $1,163 – drifting a little bit lower yet again this morning and is now down 1.1% for the week. Silver prices come in at $15.65, registering a 1.3% weekly loss. Platinum is little changed at $1,080 per ounce, but palladium is on the upswing. After falling for seven consecutive weeks palladium is rebounding a bit to $697 an ounce, a 2.5% gain on the week. Well, as Independence Day approaches, it’s worth remembering the wisdom of the nation’s Founders. Thomas Jefferson in particular warned us of the dangers of concentrating too much power in the hands of bankers and government bureaucrats. He regarded fiat currencies as inherently untrustworthy and prone to abuse. That’s why the Founders specifically wrote gold and silver into the U.S. Constitution as the legal tender of each of the states. Restoring Constitutional money to the United States is going to be a long and difficult battle. The Federal Reserve won’t give up its power to print voluntarily. And neither Congress nor the White House wish to be tied down by a gold standard. It will probably take a crisis event that causes the public to lose confidence in the dollar. Then, perhaps, the current monetary order will be overthrown and replaced with a system of sound money. In the meantime, we urge more Americans to declare their independence from the financial system this Independence Day. One way to do it is with our popular “Don’t Tread on Me” silver rounds, which commemorate the Boston Tea Party. They are a practical, low-premium way to accumulate real wealth. We also offer half-ounce Paul Revere silver rounds marking his famous Midnight Ride in 1775. Our exclusive Paul Revere fractional-size silver pieces can make a great addition to your emergency barter stash. These and other silver, gold, platinum, and palladium products are available now from Money Metals Exchange at discounted market prices. Not only are gold and silver near their 5-year lows, we’re sweetening the deal this month by offering you free shipping and insurance on all orders totaling $1,000 or more. Order online at www.MoneyMetals.com or by phone during normal business hours at 1-800-800-1865. Well now, without further delay, here’s this week’s featured interview with Money Metals president Stefan Gleason and metals and mining insider David Smith. Stefan Gleason: This is Stefan Gleason and it is my privilege now to be joined by David Smith, Senior Analyst at The Morgan Report and a regular contributor to MoneyMetals.com. David's right here in person with us in our Idaho office today. Welcome, David! David Smith: It's really good to be speaking with you today, Stefan. Stefan Gleason: David, I've followed you and admired your work for over a decade and I'm very proud to have you on board with Money Metals Exchange as a regular columnist and guest. Not only are you an expert on the metal's market but you always have so much wisdom to share about investing in general. Later in today's podcast, we're going to get your take on the markets, but first, I wanted to ask you about the speech that you're giving to the Northwest Liberty Academy later today, and it's titled, "How You Can Become the Richest Man in Babylon". Tell us a little bit about that. David Smith: It's really a fascinating project. I'm really happy to be invited to speak there. It's going to involve high school students and adults. We're talking about the Constitution and the idea of personal responsibility, and how the legislative system works, and the idea of sound money, which I define as gold, silver and copper. I'll be talking to them about the history of money and how financial accountability can be dealt with on an individual basis, and the responsibility that people have to manage money wisely and to know the ins and outs about it. I'm really looking forward to speaking there. I'll actually be speaking in the State House and I think it's going to be a pretty fascinating time. I'll be speaking there for about an hour today. Stefan Gleason: Obviously, your speech is going to talk about a lot more than just the book, The Richest Man in Babylon, but I understand it was published in the 1920s, I've read parts of it; and it dispenses financial advice through a collection of parables. Tell us about the main trust of that book and the lessons that it has for the average industry and the average person. David Smith: As you mentioned, the book itself, actually before it came a book, it was first published I believe in 1926, it was a set of parables which were written and given out to life insurance companies and other businesses to present to clients and potential clients and talk about the virtues of saving money, how to go about it, and how to keep it in its proper perspective. When it was put together in a book, it was an instant hit. Many millions of copies have been sold. Interestingly enough, that book was published in the '20s; you could still buy it today in hardback or paperback, so it's still in print and it really is fascinating. What they did was to put together the idea of a slave who was in Babylon several thousand years ago who would actually got into slavery because he had gone in the debts that he couldn't pay. Dabasir, the slave, learned because he was able to write Cuneiform, which was the way that went about plenty of things in those days, for a landowner who needed legal documents done. He would carve these characters out in the clay tablets that they had and he was paid for doing this. In the process, he met a moneylender who told him about how to save and manage money. What he learned and what he transmitted to his listeners was that instead of spending everything that you earn, you save some of it. What's critical is that you pay yourself first, you save ideally 10% or more of what you earned and then you use 20% to pay off whatever debts that you've accumulated and 70% gets you through the month. So Dabasir started doing these things. He got a hold of his creditors and told them that he would pay them back and work his way out of the debts that he had created. He started saving some for himself, and then he had some money to send to his family to keep them well clothed and fed. Within a relatively short period of time, about a year, he was able to work himself out of debtor's prison. So this was held up as a way that modern people could go about saving money, and avoiding excessive debt, and being able to keep themselves financially responsible, and they could be proud of what they've been doing. This was evolved into further discussions where they came out with a Professor Shrewsbury at Nottingham University in England who was sent the tablets to translate by the archaeologists who'd found them. He proceeded to learn the secrets that Dabasir had written several thousand years ago. Ironically, he himself, and his wife were in great debt. He was so concerned that if he didn't get himself out of debt, and if the regents found out about it, he would lose his professorship. He started applying the wisdom of Dabasir, and he and his wife worked themselves out of debt within a period of less than two years. They were showing how something that made sense a long time ago makes sense today. I truly believe that this is a message that we all can learn from, and learn to be able to manage our money carefully today because so few people do, and a lot of it has to do with the fact that they don't follow basic concepts. I think the idea of paying yourself first, and keeping yourself out of excessive debt, and making sure that you have enough to get through the month if you can, these are the things that help you to be a responsible individual. In those days, the money was gold, silver and copper. Interestingly enough, that's been real money, sound money for thousands of years since those days and right up to the present time. Even though we tend to think about the paper money in our pockets as being money, but really it has a different level of significance to people around the world than does the gold and the silver that for throughout history has been the money of last resort for millions of people across cultures and throughout history. Stefan Gleason: What theme of your talk is on personal responsibility and how that plays into both the way you conduct yourself into liberty and into investing. Talk about personal responsibility and what it means to you and what investors should think about. David Smith: If you accept responsibility to manage your money effectively, and to keep yourself out of debt, and have enough money to help others in addition to family members, it's an honorable way that you can feel good about yourself and what you've done. You can do good and you can do well at the same time. Money really is a tool. We tend to think of it as good or bad or indifferent, but in reality, money doesn't have any morality attached to it. It's no different than a hammer and some nails. It's how you go about using that money, the money that has helped to clothe your family and keep food on the table and to help others is an honorable way to use that money; and the money could be used dishonorably as well, too. Also, keeping it in perspective so that you don't let money rule you. It is a tool but its not something that your master but you master it. If you handle it properly and you know how to save it and spend it, then it will be a tool in your toolkit, but it won't be something that burdens you down. Stefan Gleason: You talked about something, David, called the Boyd Cycle, and you wrote a report for us talking about your secret investment tool and how that is actually your mind and the way that you approach investing, because a lot of folks can approach it in a way that causes them to fail. This report is something I think probably thousands of our customers and readers have seen. It's available on our website. Explain the Boyd Cycle and how that's relevant to us as investors or precious metals investors. David Smith: Investing and saving and spending money has an emotional attachment to it. It causes a lot of issues because people don't control the emotions and they don't realize. Sometimes, they don't do the background work necessary to research before they make an expenditure, before they take on a debt. John Boyd was an individual who during the Vietnam War came up with an idea, a process, whereby he was in the Air Force and he came up with this process whereby Air Force pilots could make a decision-making process in order to counter the effects of the opponents in the air when they were fighting the pilots over Vietnam. Our pilots were getting shot down at about a 1:1 ratio at that time, and so the Air Force knew that something was wrong. People weren't making the right decisions quickly enough. Boyd came up with this four-step cycle - observe, orient, decide and act - and it was the idea that if you can get these particular things done in order quickly and more quickly than your opponent, you can get inside an activity that's going on, and instead of following what's happening or being reactive, you can actually become proactive. You can be a little ahead of what's happening, and the more you practice this, then the more likely you are to be ahead of what your opponent is doing. I found this to be what I call a meta-principle, something that could be applied in all aspects of life -- in investment, in making decisions about buying a home, for example, or in combat, or whatever. If you practice this in these four steps in this order, you can get very effective. Over time, you can compress that circle so they get smaller and smaller and basically, it becomes a survival of the fittest type of idea. Boyd believed that this was really what ruled the animal kingdom as well as a human sphere, and being able to make these decisions whether on an individual basis or even in a national basis. So I adopted this in terms of thinking about investments and every aspect in life. I think it really has relevance to this. What you do on the first step was to observe what's going on around you. Let's say we're talking about the situation now in regards to investing or where we are in our country today, politically or economically or socially. You take a look at what's going on. You read the different sources of information that are out there, and you'd become someone who is conversant with the different aspects of what's going on, and you get a big picture and a small picture, then you orient yourself. You understand about your own motivation, your mindset, your capabilities, and you interface yourself within the observation that you've just done. You ask yourself, "How do I fit in all of these? How can I make financial decisions that makes sense in relationship to what's going on around me?" Then once you start doing that, then you decide, "OK, what do I want to do? What's my plan? What am I trying to accomplish? What are my goals? How do I go about it? What are the tools that I have to make these decisions to bring about, if I have a goal, a successful way of doing it or doing it in a way that makes sense that gives me the best chance of getting what I want to accomplish?" Finally, when you do all that, was basically means you’ve put together a plan, then at some point, you act. Maybe not right away, but when the tea leaves tell you that you should act, you're ready to go because you've looked at things, you thought about yourself, how you relate to that, you've made your decision, you've come up with your plan, and then when there's time to act, you do that in a way that's decisive and is well thought out, and that gives you the best chance of success. Stefan Gleason: David, one of the things I've heard you say before is invest like a brown trout. That's a cute way of approaching investing. Explain what you mean by that and then we'll get into the precious metals, and they're probably related. David Smith: I think they are you know. Stefan, I love to fish. I love to fly fish. For many years, I was a map spinner field tester. Now, a lot of my fishing ... I don't get a chance to go out a lot, but when I do, I like to fly fish because it forces me to slow down and really become one with the environment around me. I think about the Boyd Cycle and now it really applies to my fishing. A brown trout is deemed by many people to be the most intelligent of the trout out there. They don't get fooled easily. They take a position in the stream and they wait for the food to come to them, and they have a plan. Even though they have a brain the size of a pea, it's perfectly endowed for the environment that they find themselves in. They don't just rush out and grab whatever is coming down the stream, but they actually know what they're looking for and they know what the size of it is of their food. Then when it happens, they come up and they pick it up and they go back down again. The big old browns, a lot of whom feed at dark or after dark, they're very wily and they'll just come up and they'll make a little dimple on the surface, and it might be a 10-pound brown trout, whereas the little ones come up and make a big splash. The idea of being intentional about what you're doing and being totally plugged in to your environment, understanding your own capabilities, and then at some point doing it even without thought because it's been so well planned out beforehand that you didn't have to think about and doing it decisively. They don't come up and just halfway grab at something, or let's say maybe they're grabbing a bigger trout or a crayfish or whatever, they come up and they grab it decisively and then they go right back down to the safety again. I think the analogy really fits in terms of investing or in making any kind of decisions in our lives if we've gone through those four steps appropriately. Stefan Gleason: Turning a little bit to the metals and maybe the folks in Asia are more like the brown trout than the ones in the United States, but we'll get into that in a second. Silver prices are of course lower, and we've seen a larger supply deficit or the beginnings of a supply deficit crop up in the silver market. Silver is well below the cost of production. The all-in cost of production is probably somewhere below $20 per ounce, a little over $20 per ounce. Silver is well below that. Meanwhile, global demand is on the rise, particularly in India. You've mentioned and has been recently reported that India actually consumed about 30% of the world's production last year. They're on the course right now to import and to consume 300 million ounces this year, in 2015. What are your thoughts about what's happening in Asia, in general, with regard to gold and silver? Do the folks in Asia look at precious metals differently than we do here in the west? David Smith: I think they do in a large measure, but there's also some commonality, and I'll get at that in just a minute. I think there's such a long history of Asians, in China and India and Southeast Asia of understanding that gold and silver are insurance first and profit second. They don't buy it necessary to make a profit. They buy it to perhaps save their life someday or to be able to make a large purchase down the line because the banking system isn't as well-developed as it is here. It's also not necessarily trustworthy, and ours is becoming a little less trustworthy in that regard, too, so we might share some of that feeling with them. The point is that it's a way to store wealth and to have it at hand rather than to trust somebody else to hold it that maybe won't take care of it the way you do, or will lease it out to somebody else. In India, for example, women wear a lot of their wealth on their body, not to show off but to simply because they know where it is at all times. In Afghanistan, a farmer might bury a bag of silver coins in the ground in case of a bad harvest, and he can dig that silver up and use it to feed his family or to buy more seeds or whatever. They see it as true sound money and it's money that's held its value over time, the gold and the silver, and to a lesser extent, nowadays, platinum and palladium, which are also precious metals for people in the west. By collecting this and putting it away, they have the ability to cover themselves in a variety of circumstances. Some of the people that try to escape from Libya today to come across the Mediterranean, they are paying for their way with gold that they've saved. When Vietnam failed, the people that left there to leave that oppressive regime sometimes were able to save their family's life by having gold and silver to exchange for that. During the time when the Nazis were surging across Europe, many people were able to escape by having gold hammered into hasps on a chest and painted over with black paint and brought to this world. It wasn't seen when they got it out through Customs. Gold and silver have a long history of being there when you really need them. It's the money of last resort. In our culture today, we're a little bit not quite understanding. A lot of people don't get it in this country yet that we're no different than anybody else in terms of our ability to have bad times happen. You don't have to have a collapse of civilization in order for gold and silver to be there to help you. All you have to do is have a high inflation rate or an inflation rate that is understated by the government in relationship to what's going on. The government tells us now that we have a 1% inflation rate a year, which means that a dollar today will buy 99 cents a year from now. If you've ever gotten to the grocery store, we're having record prices for different types of poultry and meat. I'll tell you one thing, it's gone up a lot more than 1%. The same thing with rent and real estate and everything else. Just a few days ago, we had a government issued statement that came out showing the highest inflation rate in a number of years. It's around 2% on an annualized basis, much higher than what they anticipated. So what we're seeing is inflation is understated, and it is going to rise, and it's going to mean your money is going to buy less if you have it in paper as opposed to having some of it in precious metals to protect you and be an inflation head. That's just one aspect of what more and more people in Europe, in United States are coming to understand that they need this hedge to protect a portion of their wealth. Stefan Gleason: I want to talk for a moment about the Platinum Group Metals. You've been bullish on palladium, in particular, and you made a call a couple of years ago here on the podcast that you thought palladium was going to lead the metals and rise. It has definitely risen in an overall relatively bad environment for the other precious metals. Most of the other metals are down; palladium is higher. However, in the last month or so, palladium struggled. In fact, it gotten hit pretty hard. It's down about 10% more than the other metals. I believe more than all three of the other precious metals, four as you refer to them. Is that an ominous sign for the precious metals in general as we head into the summer months? David Smith: I don't think it is. First of all, the summer months are, the summer doldrums were metals' prices, not always but often are pretty weak or soft or flat because of the activity that declines; not only investment activity but also industrial activity whether you bought ahead. Specifically, looking at platinum and palladium, when I wrote these, I felt that palladium would bet the leader on a percentage basis that would show strength before gold and silver did. I started writing about this well over two years ago and that's really what's happened. Palladium has been as high as $900 an ounce. Platinum has not done as well. It's been really quite weak, relatively speaking. I also felt that that would be the case, not necessarily this week but certainly that palladium would be the star of the two because it can be used for things the platinum can, but yet it costs quite a bit less per ounce. These markets are not very transparent. They have a lot of short selling in the commodities futures markets. We don't always know how much there is really out there at any given time. There's also the issue of a very weak global economy. Platinum and palladium are industrial metals first and investment metal second, and so that accounts for some of the weakness. Also, we've had a secular bull market which is continued in gold and silver, but a cyclical bear market which has gone on for about four years now. As you mentioned, all the metals are down substantially from where they were a few years ago. Silver, at one point, was around $50 an ounce and gold was over $1,900, and now they're substantially lower than that. I believe we're seeing the final legs of that cyclical bear market, and I believe we're going to see a resumption of the bull market in gold and silver. We're already seeing signs of that. Even if we should break the new lows this summer, I think it will be short lived. Coming back to palladium, yes it's weak now, but it has held up really better than any of the other four metals. I think when its turn comes, it'll be very strong as well, too. These things take time to turn around, but it has definitely held its own very well, all things considered. I think it still represents an excellent store value for somebody that wants to diversify once they have enough of what they feel for their position of gold and silver. Stefan Gleason: We've seen a bottom in the markets, in the precious metals markets, a few months back. Do you believe that at this point is likely the bottom and that we're going up from here, and where do you see us in a year or two? David Smith: My opinion is probably a minority opinion on this right now, but I believe that the stocks, themselves, the mining stocks, the quality ones have probably bottomed. I believe that there's a high possibility that the physical spot price of gold and silver have also bottomed. I also realize that it's very possible that we'll see one more thrust down and there are a number of people that are talking that we'll see much lower prices. I don't think that they're going to go anyways near as low as what some of these people think. But here's the interesting thing, even if we see a break in gold and a break in silver below the prices they've held over the last couple of years, these prices can drop sharply on the paper market, but the physical market isn't necessarily going to be there to pick that up. If you go, "Oh, silver is $16 now and if it goes to $12 or $10, that's when I'm going to load up." It may go to 12 to 10 on the paper market or $14, but try to find it at $12 or $10. I remember in 2008, when silver actually traded at around $9 an ounce on the paper market, you could not find silver for much less than $12 or $14 an ounce because the sellers simply would not sell at that price, and also the demand for it was such that it kept that price higher than the $9. It didn't get anyways near that. The same thing with gold, and I know it's the same thing with platinum and palladium. You couldn't find palladium within $50 to $100 of where the paper price was, and platinum was a couple of hundred dollars higher than the paper price was indicating. I think that when you look at things like that and the spread gets wider, there are all sorts of reasons to realize that trying to wait for that bottom, wherever that is, whether it's in now or not, can be a fool's errand. Another thing I've noticed, too, in some of the people that sometimes comment on some of the podcasts that I've made, they go, "Oh, when it gets to such in price, such and such a price, I'll buy it." You know what, human nature is such, even if you could buy at that lower price, you're going to think, "Well now, maybe they'll go even lower and I'll pick it up there," and you don't act. It's one thing to think you're going to do it, but it's another thing to have the courage to act when all around you is nothing but bearish advice. Indeed, that's the time when you should be acting, because if you're going to be a contrarian, then that's when you're likely to do the best overall on the longer term, when you look at the price where it is in the future versus where you bought it. Stefan Gleason: I noticed, David, that one of the last takeaways of your presentation was to express gratitude. I just want to express gratitude to you as a contributor to Money Metals, as a guest on this podcast, as somebody who has over time been working to enrich the lives of our customers through sage investment advice and good, timely commentary on the markets, so I really appreciate what you've been doing for us for the last couple of years here at Money Metals. It's a great honor to have you here in the studio with us. Thanks again, David. David Smith: Well thank you, Stefan. I'm grateful to be here speaking with you today and my association with you. When I speak to people, like I'll be speaking to a group of people this evening, it really does my heart good to hear people that are interested in hearing about the metals and the history and how important it's been. I take a lot of trips to South America looking at mining companies and I go down there. I get the chance to go about once a year to go fishing. I mentioned in one of my articles when I've given out tenth-ounce silver rounds to people whether they are cabby or whether they are guide or someone in the restaurant or anyone associated that I happen to run into. It's so exciting to see the look on their face when they rub that silver between their thumb and forefinger, and they realize, they understand that this is real money. When they see their peso, which when I was going down there some years ago was three to the dollar, and now it's officially 10, but it's really about 15 to 20. They realize that the money that they have in their pocket, the paper money, is worth a fraction of what it was five years ago. That little piece of silver that I gave them not only has held its value, but even with the prices are today, the world paper price has gone up since that time. What's interesting is where we are today, and I'll be mentioning this in my talk later today, silver today at around $16 an ounce. David Morgan did a very deep study on this in The Morgan Report along with Chris Marchese, but they determine that the price of silver today at around $16 an ounce is in real purchasing power terms, about where it was in 2002, 2003, when the latest silver market started at around $5 an ounce. You're getting a second chance to get in at what I believe is going to be an extremely exciting move over the next few years here. I think we're going to see new all-time highs in silver, well above $50 an ounce, possibly up into three digits. We're going to see gold much higher than it's been in the past at $1,900 an ounce. I remember what Pierre Lassonde said some years ago when gold was about $700 an ounce. He's one of the most connected people in the business and he's been and done. And when some asks him, "What is the price of gold going to be at some point? What's the high price going to be?" He says, "It's going to be in four figures, I just don't know what the first number is going to be." I really believe that, and I think that we're going to see that sort of thing. By having a certain amount of that in your possession, you're going to have insurance first and profit second. Stefan Gleason: Very good, David. Thank you again. 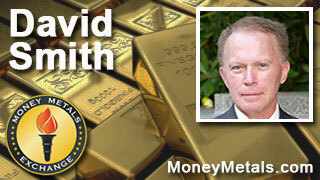 To check out any of David's fabulous articles, just go to the News section on MoneyMetals.com or type David Smith in to the search box, that will lead you to all of the work that he's done for us. You can also see his analysis at Silver-Investor.com that's David Morgan's website. That will do it for this week. Thanks again to David Smith of The Morgan Report and a contributor to MoneyMetals.com. Check back next Friday for the next weekly market wrap podcast. Until then, this has been Stefan Gleason with Money Metals Exchange. Have a great weekend everybody. Stefan Gleason is President of Money Metals Exchange, a precious metals recently named "Best in the USA" by an independent global ratings group. A graduate of the University of Florida, Gleason is a seasoned business leader, investor, political strategist, and grassroots activist. Gleason has frequently appeared on national television networks such as CNN, FoxNews, and CNBC, and his writings have appeared in hundreds of publications such as the Wall Street Journal, Detroit News, Washington Times, and National Review.